Bruce was born in New Orleans on July 11, 1958. His parents were part of a post-World War II migration of Cajuns to New Orleans from the rural farming communities of Avoyelles Parish. Located in the uppermost corner of Louisiana's "Cajun triangle," Avoyelles Parish is the forgotten part of Cajun country. Nevertheless, the language and customs of the Cajun people are as deeply rooted here as anywhere in the state. And whenever you walk through the door of Bruce's family home, you return to Avoyelles Parish. His parents have never abandoned their beautiful Cajun French, and they've kept their gumbo and fricassee simmering on the stove. The same, instinctive pride of culture and heritage that has guided his parents' lives, and his grandparents' lives, is now invested in Bruce's music. Music came to Bruce at an early age, and in the most traditional manner--handed down from father to son. When he was growing up, no family gathering was complete without a little playing and singing. His father picked the guitar, "Carter Family-style," while his Uncle Alton lent a remarkable voice to the traditional Cajun songs and old-time country ballads. When Bruce turned five, his father presented him with a guitar, and by the age of ten he was also bearing down on a five-string banjo. It was in 1978, after attending the annual Festival Acadiens in Lafayette, that Bruce was inspired to devote himself to the French accordion. By 1980 he had his own Cajun band, and was honing his skills at regular Thursday-night fais do do dances at the Maple Leaf Bar. Over the next six years, Bruce Daigrepont almost single-handedly popularized Cajun music and Cajun dancing in cosmopolitan New Orleans. In 1986 Bruce moved the fais do do dance to the original Tipitina's, corner of Napoleon and Tchoupitoulas streets, where it continues to this day, every Sunday evening from five till nine. Bruce is one of New Orleans' and Louisiana's great musical institutions; and he has emerged as one of Cajun music's finest cultural ambassadors. In North America he has performed at such prestigious venues as New York's Lincoln Center, Wolf Trap Center for the Performing Arts, the Winnipeg Folk Festival and the National Folk Festival. Over the past ten years he has taken his music to France, Belgium, Holland, Switzerland, Germany, Denmark, Norway, and Sweden. At the request of the American Embassies, Bruce and his band have performed even in the third-world countries of El Salvador and Venezuela. Most rewarding, though, are his annual "homecoming" pilgrimages to the French-speaking Canadian maritime provinces of New Brunswick and Nova Scotia, where the history of the Louisiana Cajuns had its harsh beginnings. It is here that the deeper meanings of Bruce's original song creations can be appreciated and celebrated to the fullest extent. Imagine 2,000 Acadians packed into a hockey rink in the little town of Buctouche, New Brunswick, raising their voices in unison to the chorus of Bruce's "Marksville Two-Step:" "On est tous cousins, cher, one est tous cousines" - "We're all cousins; we're all cousins!" It is the spirit of cultural reunion personified. Bruce is fully immersed in the singer-songwriter tradition. Several of Bruce's compositions such as "Marksville Two Step," "Riviere Rouge" and "Nonc Willie" have entered into the standard Cajun dance band repertoire while other tunes of his such as "Coeur des Cajuns ", "Disco et Fais Do Do" and "Laissez Faire" are now part of the recorded repertoires of Francophile bands from other parts of the world. His most popular anthem of Cajun pride, "Acadia a la Louisiane, " has even been translated into Danish! If he were writing in English, he might find greater fame and fortune. But Bruce is about pride of culture and heritage; pride in being what he is, a Cajun from the heart, with a story to tell, through his music. Not that you need to understand French to get on Bruce's wavelength. His art is totally infectious. For one thing, he's one of Cajun music's most gifted singers. In keeping with the old-time dance hall musicians, he sings loud and passionately, in the high tenor register, where many Cajun singers of today fear to tread. He can shift his powerful voice from bell-tone clear to whiskey-rough. The same spirit of adventure that distinguishes his singing is also present in Bruce's accordion playing. He has developed a highly individual style, patterned after no one past master, but imbued with the zest and vitality of them all. People are often astonished by the fact that, while the feel of a guitar lingers heavily in the mix, Bruce does not actually have a guitar player in his band. Neither is there a keyboard. The unusually full sound is ultimately traceable to the wall of complex rhythmic underpinnings that Bruce lays down on the accordion. Even while singing his heart out, he's busy executing difficult rolls, trills and hammerings-on that simply defy a lot of other very good accordion players. Bruce's recording career began in 1986 with his first Rounder Records release, "Stir Up the Roux," followed by "Coeur des Cajuns" in 1989, "Petit Cadeau" in 1994 and "Paradis" in 1999. Each of these projects has garnered critical acclaim. What makes Bruce's recordings so special is his unwavering attention to detail, his inventiveness, and the sense of mastery he brings to every song. His latest release "Paradis" comes closer than any of Bruce's previous recordings to the sound of his live performances. And what makes his live performances so special is the air of freewheeling spontaneity which prevails over everything that happens. Bruce never uses a "set list." Instead, he maintains a floating repertoire of more than two hundred songs, from the traditional Cajun waltzes and two-steps to those of his own creation, to ancient fiddle reels, deep blues, swamp pop, Zydeco and R&B. On stage, he is free to shuffle these songs around at will. Or, as Bruce so aptly puts it, "I just play whatever song starts to come out of my fingers," while the band hangs on for dear life. Consequently, no two Bruce Daigrepont concerts are ever the same. It's and exhilarating experience, for audiences and band members alike. 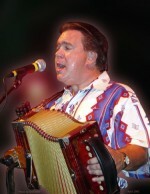 Bruce keeps his music focused on the instruments that have historically defined the Cajun sound--accordion and fiddle. The only additional instrumentation on stage is an aggressive rhythm section (bass, drums and an occasional rubboard or triangle) which takes pride in "keeping it Cajun," sustaining a hard-edged attack while assiduously avoiding the homogenizing influences of rock'n'roll, Nashville, etc. Bruce has always enjoyed exploring new directions, but, while constantly testing the resilience of the Cajun tradition, he never goes "too far." He is thoroughly steeped in the music that he so lovingly upholds, and he knows instinctively what is needed to keep it alive and well. As a fellow musician observed in the liner notes to "Paradis", "Bruce's vision may just be bigger than any of us realize." Indeed, it seems that news is finally getting out: Bruce Daigrepont is making Cajun music for the ages. News and Reviews for Bruce Daigrepont Cajun Music, Inc.